I’ll admit – it wasn’t until recently that I got into sharing my food (I used to be like Joey on Friends with a no sharing policy – yes I’m greedy.). And thank goodness I learned to share cause I got to try more dishes that way! 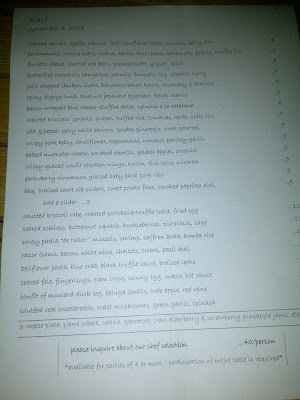 Their menu changes daily to reflect whats fresh! 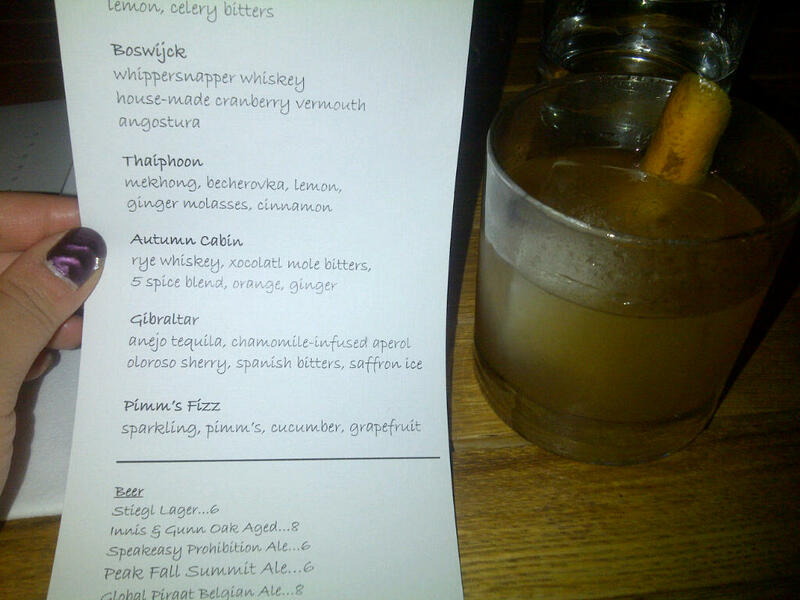 The menu also offers several original cocktails and a large wine selection to choose from. Take a look! 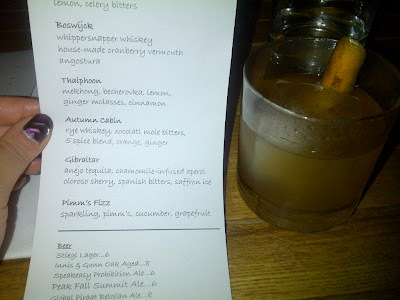 My Autumn Cabin - I love drinks with ginger in it! After selecting 5 dishes, dinner buddy S and I were presented with an amuse bouche: Moroccan Lentil Soup. 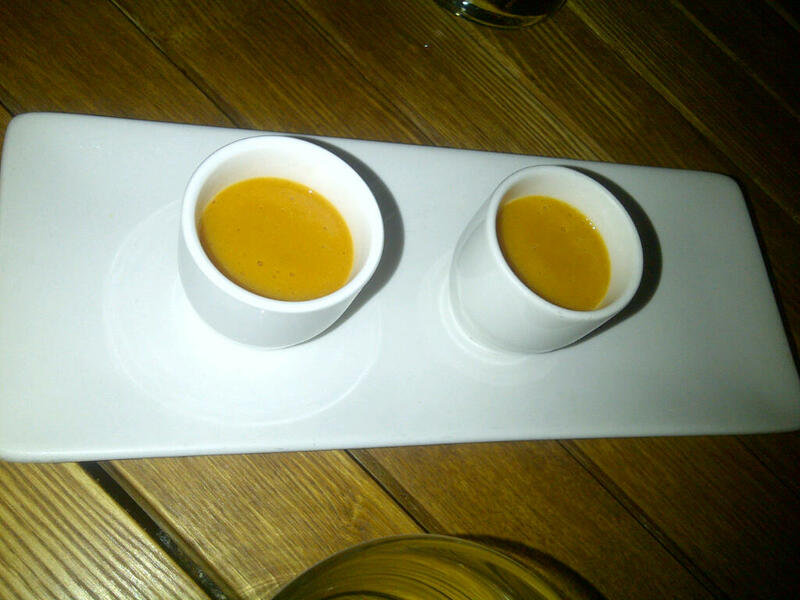 The soup was a puree, so very heavy and creamy. There was a strong tomato-ey taste and the spices were definitely there. While good, this was a bit strong for me to open my meal with. Salt and Pepper Spicy White Shrimp - my fav! Salt and Pepper Spicy White Shrimp. This was amazing – probably my favorite dish of the night. There was a bit of an Asian undertone, but still very unique. 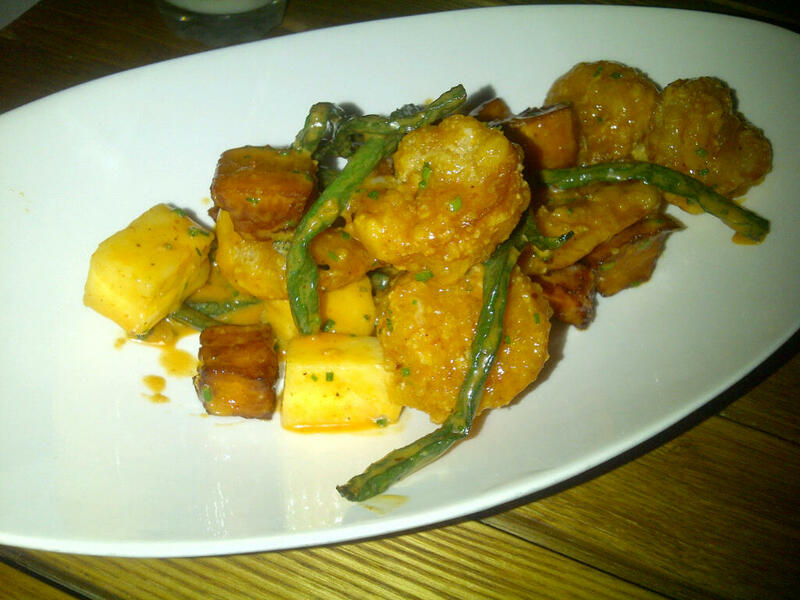 The shrimp were big and crispy, and served in a creamy slightly spicy sauce with pineapple and sweet potatoes. Salad. 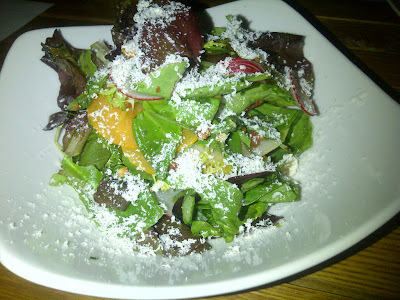 Served with persimmons, comice pears, radish, bacon, blue cheese, hazelnuts, greens, truffle vin. Lots of ingredients and I enjoyed the light and fresh dish between all the other rich dishes. Everyone needs a veg and this was perfect! 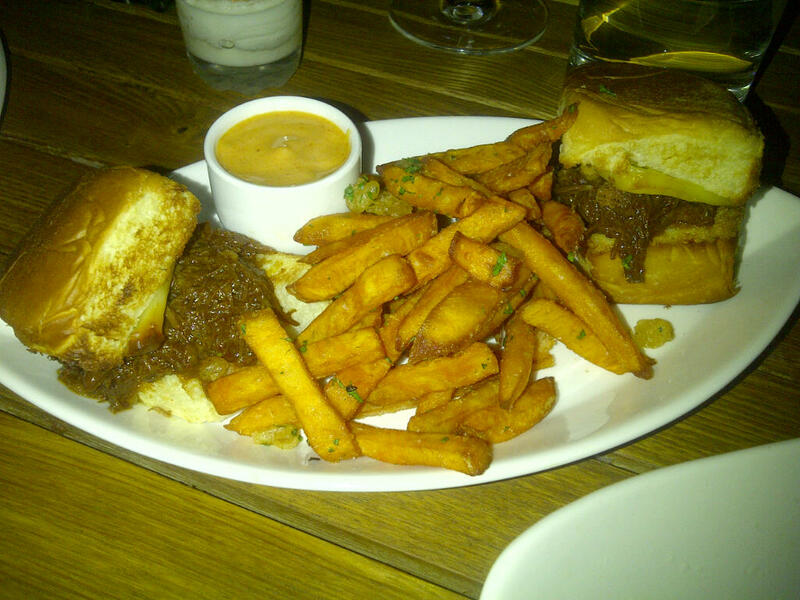 BBQ Braised Short Rib Sliders. These were so soft and the meat from the short ribs was tender. Slightly sweet but I liked the BBQ flavor. Mayo sauce - “smoked paprika aioli” the menu says. Not quite sure what that is but I thought it went great with the sliders. Came with sweet potato fries that were perfectly crispy! 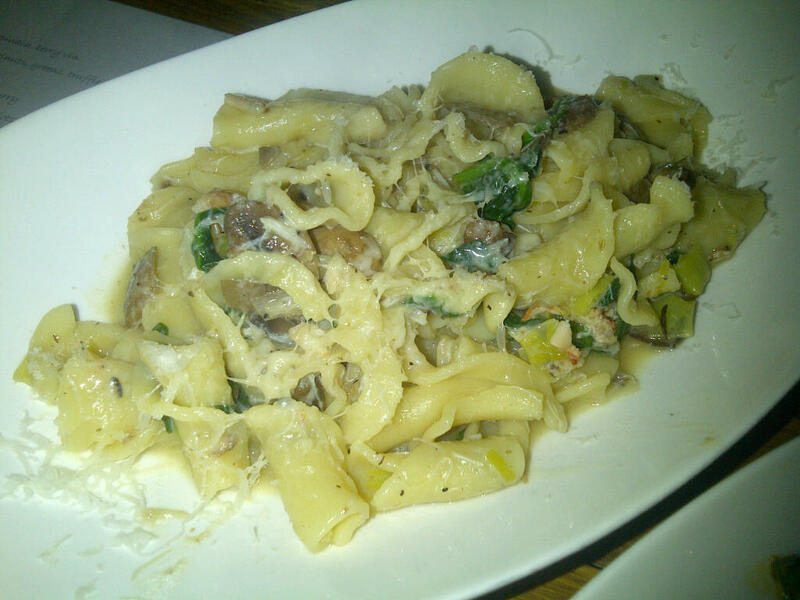 Any pasta with crab and truffle sauce is good in my book! Bellflower Pasta with Blue Crab, Black Truffle Sauce, Braised Leeks. This dish was sooo good. Creamy, rich, truffle-y. Mmmm…. 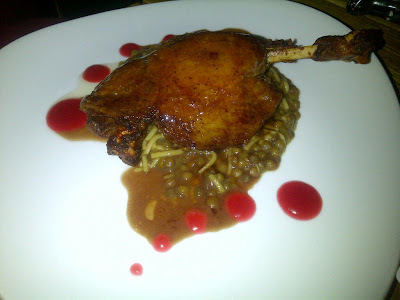 Confit of Moulard Duck Leg. I don’t eat duck, but this was good. The skin was crispy (you could hear the crunch as you cut it!) with a great glaze. The meat was fall off the bone tender – no knife needed! Served with lentils that were tasty as well. As you can see from my pics, I was lucky and got to try a good variety. Each dish had its own distinct taste and memorable flavor, which still causes my mouth to water as I write this post up. One more (good) thing to note - I expected tapas sized portions (aka tiny) but each dish came out with a decent portion for sharing plates! 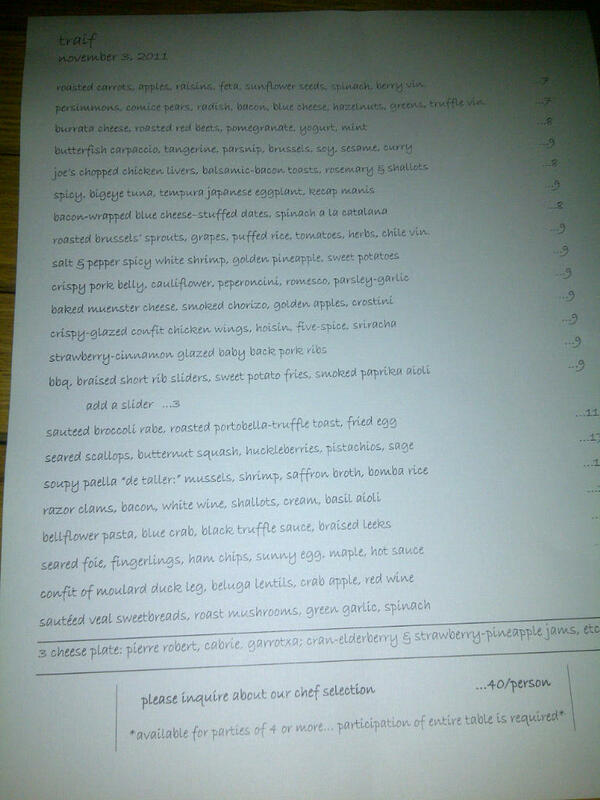 This, of course, means I over-ordered for the two of us but hey – don’t let that discourage you. Order EVERYTHING if you go and let me know which is your favorite! 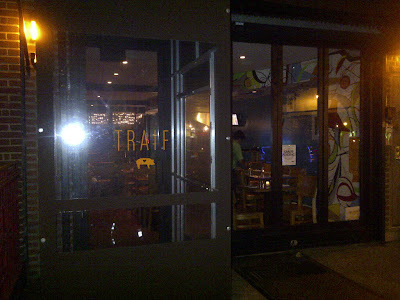 We love Traif! The seared foie dish is one of my favorite executions of foie gras. We also really like the spicy tuna and ribs. You should go for a repeat trip just to get those! :) Like you said, the portions are actually quite generous and the food is inherently heavy so 2 dishes a person is more than enough. Foie gras, spicy tuna, ribs!!! Sounds like a repeat trip is a must for me - thanks for the recs!